In the run-up to Black Friday, Guitar Center has announced a slew of deals, but we reckon this Epiphone Les Paul Traditional Pro-III offer is the highlight so far. GC is offering $100 off select finishes of this nicely spec'd LP, which brings the total down to a tasty $299. 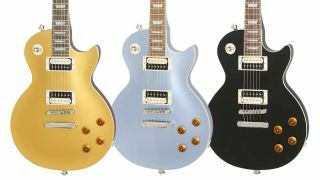 Those three finishes - which you can see above - are Metallic Gold, Pelham Blue and Ebony; Wine Red and Pacific Blue finishes will cost you the regular $399. The Traditional Pro-III features a maple veneer-topped mahogany body, mahogany neck with pau ferro fingerboard and Alnico Classic Pro humbuckers with coil-split; you’ll struggle to find a better-appointed Les Paul at this price.